It’s officially summertime here, and with it comes the hot weather I have come to associate with Italian summers. When it’s this hot, I find it hard to eat a normal meal, and often at lunchtime I have a “meal replacement” in the form of a nice gelato or ghiacciolo (ice pop/popsicle). The author of one of my absolute favorite blogs is David Lebovitz, who is also an author of several cookbooks, including the latest one that’s exploding all over the internet, The Perfect Scoop. I actually hesitated ordering this book, not because I live in Italy and excellent gelato is easy to come by (though it is, check out my Tour del Gelato for some favorites), but because I don’t own an ice cream maker. In fact, I’m not sure I plan to, at least, not in the next few years. As I mentioned in my last post, I am just now getting my kitchen to the point where I have most of my favorites and a few perks (PS: Be sure and add your favorite cookbook in the comments on that post, and you could get a bag of digestive sugar in the mail!). But I didn’t get the “required” wooden pasta-making block, and I’m making pasta on my own – lots of it. So why should I let a simple thing like not having an ice cream machine stop me? One of the first things I did with The Perfect Scoop was not to look at the table of contents, but to go directly to the credits page to see who did his food styling and photography. The same goes for the other cookbooks I ordered recently. I’m so visually stimulated with cooking, I need that visual prelude to give me a good goal and motivation. And David’s book is an excellent resource – the photos are beautiful (by Lara Hata) and I think the ratio of photos-to-recipes is also quite good – of course I would love one for every recipe – but he knows exactly when to include a photo for a recipe that’s hard to visualize or describe. the first 19 pages are a reference to clear up terminology, give you helpful hints about selecting quality ingredients, and give you step-by-step instructions to make his ice cream custard which is the base for most of the ice creams in the book. You can see the influence of his blogging in the layout of his cookbook – at the bottom of most recipes, he includes a “Perfect Pairings” recommendation with a reference to another recipe (mix-in, topping, other flavor) in the book. Genius! If it was a blog, it would be hyperlinked. I like how he knows that people reading his cookbook are going to take the basic recipe and run with it. Bravo! I have actually tried a few recipes already from the book, but I wanted to include this for the Hay Hay Donna Day #13, Sorbet, hosted by Eat Drink Live. I feel like I am making a lot of confessions lately! But I am not really a big watermelon fan. Watermelon is known by two names here in Italy – cocomero and anguria, and it really depends on who you’re talking to (though I used cocomero more in Tuscany and Rome). I didn’t plan this, but Shelley has a post up about cocomero today, too! S is a big fan of anguria, and he’s the reason that we had a 6 kilo watermelon in our fridge over the weekend. No man can eat 6 kilos of watermelon alone (even if he wants to!) so I knew I had a good opportunity to try out The Perfect Scoop, even if I wasn’t sure I would be that excited about the results. Well, let me say that I kept “tasting” it over and over during the freezing process. I couldn’t get enough! I thought it was great, and I think I figured out my new favorite way to eat watermelon. Yum! A note for those of us without an ice cream maker: Do NOT make this right before you want to eat it. It will take hours to set up. Your freezer will figure out you are stalking it and just like the watched pot, it too will refuse to freeze faster. Heat 1/2c. watermelon juice with sugar and salt until fully dissolved. Mix in with remaining watermelon juice and mix well. Pour directly into freezer-safe pan (I used throwaway aluminum baking pans) or flat plastic container (may take longer) and freeze. After one hour, start scraping the sides and pushing the crystals to the middle of the pan. Continue this for several hours, if you have the patience! If the mixture gets too hard or solid, you can take it out of the freezer for 10 minutes until it starts to soften. I was so impatient, I started eating (and photographing it) while it was still freezing, and had more of a slushy granita consistency, but as it sets up, it becomes quite scoopable and sorbet-like. I wish I had had chocolate chips on hand like David’s recipe calls for, but I didn’t. In the end, I thought this was excellent on all its own. Now I know what to do when there are only large watermelons for sale! I will definitely be making this again. 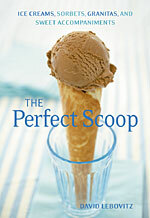 Check out other bloggers’ experiments with The Perfect Scoop through David’s round-ups on his blog. I like your timing on this! Some weird ESP going on. I can just see S trying to down an entire 6 lb. watermelon, that’s awesome. Now, this is a wee bit off topic, but have you ever heard of a contraption called the Bimby? It’s way more popular with my friends up north, almost no one in Rome has it except some friends of ours from Bologna/Bolzano. Costs an arm and a leg, but it makes sorbet like you wouldn’t believe. (Also makes pasta, rice, entire dinners… it’s a really bizarre machine). Since I can’t afford the Bimby I’ll have to try your recipe. Looks good! Wait… 6 kilos! Even better! Sara, I am going to buy this cookbook. Curious, do they sell Cuisinart Ice Cream makers in Italy or is that like bring sand to the beach? I love the one I have but of course would sell/give away all my electronics here. @Heather – I’ve just bought my first ice cream cookbook, but I could definitely entertain another! @rowena – the granita fits in any fridge-freezer just right. Time to chop up your cocomero! Time-sharing appliances… hmmm… that’s a very interesting idea. But if I buy the Bimby I’m not sharing it with anyone. Ha! That puppy is like the Ferrari of kitchen appliances. So, how would the time share work? Would we have to meet up to exchange our appliances? Would each city have its own appliance network? I could definitely go for borrowing a bread maker from someone. I don’t own an ice cream maker either (unless you count the old cranker in the garage) I still make sorbets, this one looks so fresh! No ice cream maker here either but I got to try this one. I love sorbets and got to try it. Looking very pretty in pink Sara! My daughter is watermelon mad and would go nuts for this! Thanks for entering. This watermelon sorbet looks so festive and refreshing. A great post with practical information. A few years ago, I really wanted an ice cream machine for Christmas. I got it and I never used it. It is a nice machine. I even have many recipes. My advice before buying a machine is to think if you will really use it. I am like you, Ms. Adventures in Italy. When I am looking at a cooking book, I need to see lots of beautiful plated photos to get me interested. That is the main reason why I started buying Donna Hay cookbooks. On the other hand, Jamie Oliver got me with a way he describes his love of food. Yum. I don’t know what else to say. Glad you liked my recipe in David’s book! On my site, http://www.divinacucina.com , I have it as the granita, the chocolate chips instead of seeds are my favorite part. I do like David’s version as popsicles though! am on my way back to the states to teach right now and am going to look for some popsicle molds and get the LLBEAN ice cream making soccer ball I saw online, think the Italians will love it! This sounds wonderful! I absolutely LOVE anguria. We have a wonderful Italian ice place near us, and they have a wonderful watermelon flavor! Very refreshing! I am also happy to hear that you don’t have an ice cream maker – neither do I. And I too am iffy about whether I will get one or not. I have seen The Perfect Scoop on a lot of blogs and I am really tempted to get it, or at least try some recipes, but for true ice creams, does he say to use an ice cream maker? Or does he give a way to make these wonderful creations without one? It looks delicious Sara. Thanks for joining HHDD. I just love watermelon, it is so refreshing..! I love watermelon, and being from Michigan I can only get it during a few months of the year. Of course it’s in grocery stores year round but those are harvested before ripening for shipment so they’re only a simulacra of the real thing. This summer I grew my own watermelon, and I can say without a glimmer of doubt that eating a watermelon fresh off the vine is the closest I’ve come to nirvana. They are difficult to grow so far north, but this is my third year growing them and I finally had such a bountiful harvest that even my dog got several her own watermelons! I must say I LOL at your observation that “No man can eat 6 kilos of watermelon alone (even if he wants to! )” The “Allsweet” and “Scarlet Sweet” watermelons I grew averaged 10-12 kilos, and for over a month I’ve been eating at least 4 per week. Am I sick of watermelon yet? I finished the last one at breakfast today, and now I’m researching online to select varieties to grow next summer! I should pick that one up–thank you for featuring it! My favorite ice cream book so far has been Bruce Weinstein’s “Ultimate Ice Cream Book,” but I’m always looking for more good stuff.